There are plenty of references on the Internet to pickup (‘pup’) design and use, so without being condescending, this is aimed at the new comer (or older slow-hand!) who wants to understand the ‘engineering’ basics of the Ironstone pups. The following is a much abbreviated look at the specifics of single coil design (as used in Stratocaster & Telecaster style guitars), and a comparison with humbucker designs. There are a huge number of different opinions on why pup designs sound as they do and the perceived merits of various materials and methods. The following are therefore Ironstone's views only! Single coil pickups are just what they say, a single coil of wire that has been wound several thousands of times around a plastic or fibre bobbin. Magnetic material is then introduced into the bobbin. This is normally in the form of a magnetic bar material on the base of the bobbin (with 6 steel pole pieces that magnetically ‘connect’ the bar to the guitar strings), or 6 pole pieces which are themselves made of a magnetic material. Though there are variations, the bar style is normally a Ceramic magnet, the pole piece style normally Alnico magnets. Whatever the method, the result is a multi-turn coil of wire in close magnetic coupling to the magnets. Basic electrical theory states that moving a metal object (i.e. metal guitar strings) near this coil / magnet assembly will generate a small voltage / current in the coil. This very small electrical signal is then taken off for amplification & processing outside the guitar (except for ‘Actives’). By their very nature single coil designs do generate some background electrical noise / hum etc – its part of their ‘charm’ and sound quality. This is lessened in switch positions 2 & 4 if the middle pup is RWRP (see below), or by the use of 'Humbuckers'. The first thing to make clear, is just because a pup uses Ceramic, Alnico or some of the other exotic magnet materials, it does not make that a good or bad pickup! However, particularly at the budget end of manufacturer’s guitar ranges, it’s often the execution of pup design that seems to suffer from cost control the most. This would be typified by the use of cheaper Ceramic bar style magnets and relatively few coil windings (i.e. a low DC resistance pup). Alnico magnets (Aluminum / Nickel / Cobalt) were used in nearly all of the popular vintage pickups. Whilst more expensive than Ceramic, Alnico magnets generally give a warmer, fuller, tonal response and tend to a smoother distortion tone with a more prominent midrange than Ceramic. Alnico comes in different grades; each has its own subtle characteristic with V normally accepted as the best. Specifically, Alnico V is a relatively strong magnetic material, so can be worked into small bars to use as the pole pieces themselves without a bottom bar. This maximizes the magnetic coupling to the vibrating guitar strings and makes for both sensitivity (i.e. that can also positively influence sustain) to playing style and general strength of output. Note that too strong a magnet (or having the pup set too close to the strings) causes the pup to ‘pull’ the strings down to the magnets to some degree which dampens sustain – not what most guitarists are looking for. So that’s the basics. If all 3 coils (Stratocaster) were made exactly the same, they would all work fine but you would miss out on the joy of the unique tones from positions 2 and 4 on the 5 way switch, part of the real vintage flavour. To achieve those 2 extra distinctive tones (to get them on the early Strat’s the 3 way switch was ‘jammed’ in the ‘in-between’ positions), the Middle pup needs to be a bit special. RWRP means Reverse Wound & Reverse Polarity. So the coil is actually wound around the former in the reverse direction to the other 2 pups and the pole pieces are aligned the opposite way round to the other 2 pups in the North / South sense (try putting a compass over the pole pieces and see for yourself). That means that in positions 2 and 4, the RWRP Middle is switched in parallel with another pup of normal winding and polarity. The result is somewhat similar to the ‘Humbucker’ effect in that some of the single coil background noise is cancelled (you should hear this from your amp when you switch between single and ‘joint’ pups), but also 2 new tones are created by the interaction of the signals generated from each coil – magic! All Ironstone Stratocaster pups are built with a RWRP Middle coil. 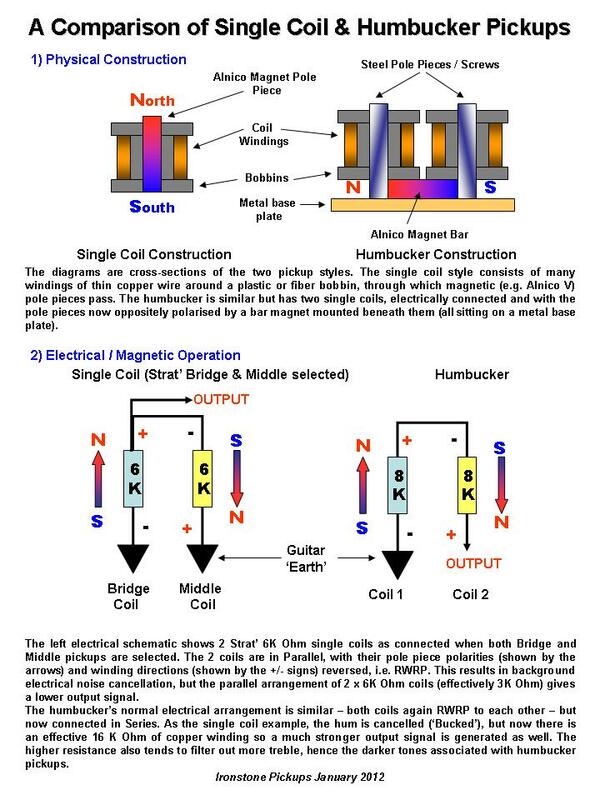 Humbuckers work on a similar basis, as they are effectively 2 single coil pickups, mounted side by side connected in series (see diagram below). But as importantly, the side by side arrangement allows the noise (hum) to be eliminated ('bucked') in a similar way to the Strat in between settings. Things get a bit more complicated with 2 humbuckers and a middle single coil with coil tapping etc, but that's another story! The established easy way to get an idea about a pickups performance is to measure the DC resistance (using a basic multi-meter for example) of its coil i.e. between the 2 output wires. Whilst this gives no real clue about tonal quality, it at least gives a relative measure of the number of coils on the bobbin and thus likely ‘strength’ of output. The classic vintage pups were typically in the 5500 to 6000 Ohms range, written 5.5K to 6.0K Ohms. So the lower the number of turns the weaker the signal / pup sensitivity. If you have come across Ceramic magnet based 3 to 4 K Ohm pups, its no surprise they sound ‘thin’ and ‘lifeless’. But sadly, the more turns you put on a pup, the more the capacitance and inductance values associated with the coils of wire also increase. These do several things to the tone, most noticeably rolling off some of the treble and potentially introducing a little more harshness. So for the best compromise of bell like clarity and strength of output, the 5.5 to 6.0K area is fine. If you want SRV ‘dirty’ tones the windings need to move up the scale towards 8K or more. Typically players want the Bridge to be the most cutting tone, hence the Bridge is often made with a ‘hotter’ DC resistance (i.e. more coils). The tone of a pups is actually a terribly subjective thing, but most guitarists (or music appreciators in general), can recognise the crude definitions of clean and dirty tone. As already mentioned, the height of the pup (i.e. the distance between it and the strings) also has a dramatic impact on the pups output (go to Guitar Pickup Adjustment) – few of the factors described here are not in some way interdependent! If the output level of a pup is impacted by the gap to the strings, then clearly if the strings do not pass vertically above the centre of the 6 pole pieces, the magnet coupling and thus output will not be at its best either. The strings on a guitar flare out in width from the nut at the headstock down to the Bridge. That means the horizontal distance between strings increases from the Neck to the Bridge physical pickup positions. So to compensate for that, better quality pickups use pups with different spacing of the 6 pole pieces (measured from the centre of the 2 outer ‘E’ string poles). If there is an industry standard, it’s probably 50mm for the Neck and 52mm for the Middle and Bridge, which is used for all of the Ironstone pups. When it comes to humbuckers, a similar situation exists but there are 2 distinct standards, derived from the key original manufacturers. Gibson's humbuckers (often called 'standard spacing' or similar) are designed for their narrower bridge string spacings - approx 1.9" (48mm) compared to Fender's 2.01" (51mm). The Ironstone bridge humbuckers, at approximately 51.5mm pole spacing, are thus 'F' (i.e Fender) spaced. Just as the width of the poles has an impact, the relative distances between each pole and its string determines the output level for that string. Normally strings are set (via the bridge saddle heights) to more or less follow the curve of the fretboard. The heights of the pole pieces would ideally try to mimic that profile so keeping the pole piece to string height constant for each string. In true vintage Strat’s this was a very pronounced curve or ‘radius’ e.g. 7.5 inches. Most of the modern more budget end guitar necks are considerably flatter 10 to 12 inch for example. Given the market that Ironstone pickups are serving, the poles are therefore very lightly staggered to match the modern flatter profiles. So with the pup complete, all that remains is to connect it to the rest of the guitar electrics. As with most things ‘guitar’ even that has its variations. In basic terms, so long as there are 2 electrically isolated wires, one from each ‘end’ of the pup coil then the circuit can be completed. This is often done using 2 distinct (colour coded) wires. Purists favour wax or cloth covered wire but there are many variations. The Ironstone ‘engineering’ based solution is to use shielded ‘Audio Cable’. That allows the ‘hot’ output signal in the inner wire to be shielded by the braid of the outer core and generally keeps things a bit tidier in the cluttered world that is the back of the scratchplate. Simple! So that is why Ironstone pickups are built as they are and ultimately why they sound as they do. We hope this has been in some measure educational, any points that need clarifying please just ask.